I've just been sorting out my box of oil paints, to see which ones to store (you can't travel with oil-paints because they're flammable ... I found that out the hard way at LAX in 2003) and I found this very small and very old tube of Windsor & Newton cadmium scarlet. 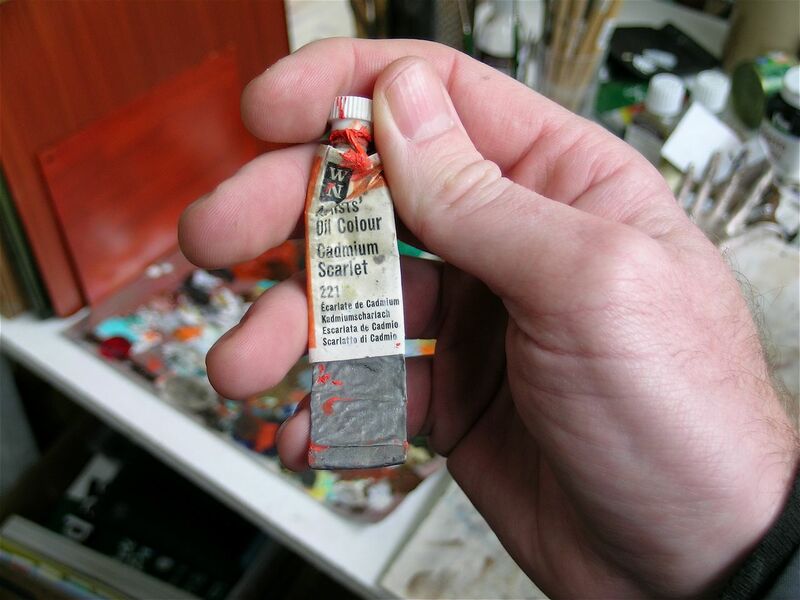 It was given to me by Rob McLeod in about 2002 and there was a point where I was mixing a brush-hair-worth of it through every colour I used to paint with. It gave the colours a beautiful smoky, hazy quality to them, which was needed for the paintings I was painting around 2004 - 2006 that had primarily white, neutral backdrops. I've bought newer tubes of this exact brand and colour, for exorbitant amounts of money, but none of them have matched the pigment quality of this tiny tube.